Schultz, twenty-two, is the owner and founder of Art Kicks, a custom shoe-art business that started in Eugene. The first inklings of Art Kicks came in March 2009. Schultz was near broke when a friend suggested he use his illustration skills to draw on shoes for money. Schultz’s first customers were friends and the art was free. “It was great because it generated buzz and simultaneously created content” for his website, Schultz says. In just two weeks, he was able to begin charging for personalized kicks. Soon, his clientele spread from the UO campus to the greater Eugene community and beyond. After creating forty pairs, Schultz saw the opportunity to expand his business. He teamed up with Cam Giblin ’11, a freelance illustrator and fellow advertising major. Each artist specializes in a different style. Giblin’s shoes echo the vibe of his splashy watercolor illustrations, while Schultz creates shoes saturated with intense color and emblazoned graphic-novel-type images. 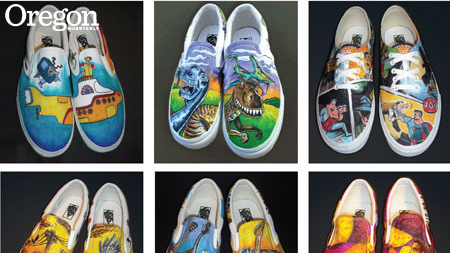 It takes between six and twenty hours to complete a pair of Art Kicks. Clients contact Schultz with an idea that he turns into sketches. After receiving approval, Schultz lightly pencils the design on the Vans. Next, he carefully adds color with one of his 600 markers. He waits for each colored section to dry, then outlines, shades, and crosshatches with thin black lines. Sometimes he lets colors bleed, producing a painting-like effect. Schultz finishes with two coats of water-repellent. A pair of Art Kicks goes for $200. And while Schultz finds himself increasingly busy—working days at a large advertising agency in San Francisco—he still finds time for creating masterpieces on canvas. Shoe canvas, that is.